Globalisation is real and Samoa is not immune from the impact, both positive and negative. The positive side is that the world has been reduced to the size of a global village so that technology and innovation has made certain things a lot easier. But wherever there is good, there will always be the bad and the ugly. Now when we talk about globalisation, it doesn’t just involve technological advances. It also involves people movement, trade and the like. It has to be said that one of the biggest challenges of our time is trade. And since Samoa became a member of the World Trade Organisation (W.T.O. ), the opening up of our borders to different products from around the globe has not come without concerns. When the idea of Samoa becoming a member of the W.T.O. was first introduced, it was naturally met with strong pessimism. This was largely due to fears that economies like Samoa – that are least developed - cannot foot it on a level playing field with everyone else, let alone superpowers such as America, China, Europe and others. The private sector was especially concerned that the interests of the local industries will be lost in the wave of globalisation. But the man driving the W.T.O. accession efforts at the time was the Minister of Trade, Commerce and Industry, Hans Joachim Keil. At the time, he had a simple message. He said “globalisation is the reality of today and there is no way we can ignore it. In Samoa today, the mushrooming of foreign-owned businesses and their selling of inferior products cannot be ignored. It’s scary seeing so many different products with foreign language labels that we cannot understand. But that’s just one of the challenges. Then there is the issue of foreigners driving our very own people out of business. How many local shops have we seen being taken over by the Chinese and foreigners in the past few years? And while this has been happening, more and more of our people are resorting to sell pork buns and BBQ on the side of the road. Earlier this week, a front page story titled “Citizens warned against registering foreign firms” raised an interesting point. 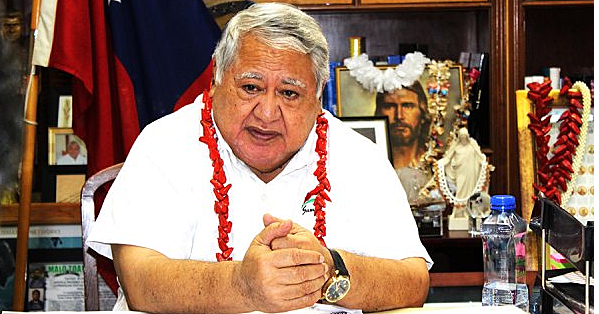 In it, the Minister of Revenue, Tialavea Tionisio Hunt, revealed that some locals are fronting up to apply for retail licenses for businesses run by foreigners. “This is illegal and we have sent out Internal Revenue Officers to investigate these claims,” said the Minister. “The problem is our own people. They submit the application as if they are the ones who will run the business, yet we find out there are Chinese people in the backrooms monitoring the cameras and keeping tabs on the workers. Well the Minister and his team might want to look a bit harder. Looking at the number of these foreign-owned shops, it looks like the law is being ignored right before our eyes. Come to think of it, we doubt this was part of the original plan when our Government embraced globalisation and W.T.O. rules. Did anybody see this coming? And with this happening, does anybody have a solution? The worry is that more and more local people are waking up to realize that if they don’t do something pretty soon they will have nothing to fall back on. If our humble opinion is sought, we believe the solution goes back to what we’ve been saying that the government must invest money to encourage people to develop farming and agriculture. The government should then invest in setting up factories where our wildly grown breadfruits, mangoes, papayas, lemon and so forth are canned and exported. That way employment is created, people have money in their pockets and the economy is stimulated. Most importantly, there is a solid base for exports earning us much-needed revenue. The worry for Samoa is that in the absence of a solid export base, the government will continue to depend on these foreigners and investors to create employment. Which is okay but it comes with a hefty price tag. But these foreigners will bring their conditions and impose their will because at the end of the day, beggars cannot be choosers. And when people become more and more desperate, they will have no choice but to follow in order to survive – including lying to the Ministry of Revenue about owning those businesses.